Come and Experience one of the LARGEST homes that South Mission Beach has to offer with recent upgrades! Devon Sand Castle is a deluxe vacation home with an unbeatable 600SF roof deck! Home is divided into two units, with a private one-bedroom, one-bath apartment on the lower level. The second level of the property encompasses the main kitchen and living area—a large, open layout perfect for larger families. Kitchen is fully furnished with everything you'll need to cook a delicious meal for yourself and your family, along with added features like granite countertops, multiple eating areas, two refrigerators, and a washer/dryer. Just off the living room is a half-bath, and a small sleeping den for up to 1 child. Further down the hall are the two bedrooms and a shared hallway bathroom with a tub/shower. One bedroom features a Queen bed, the other a Full over Full bunk bed + a Twin trundle, perfect for up to 5 kids! Third floor opens into the large Master suite, complete with private bathroom, walk-in closet, and a Cal-Kind bed. Next to large Master is the loft bedroom with Queen bed. There is a Master Suite on the same level, with a private bath, walk-in closet, private deck, and a Queen + Twin bed. 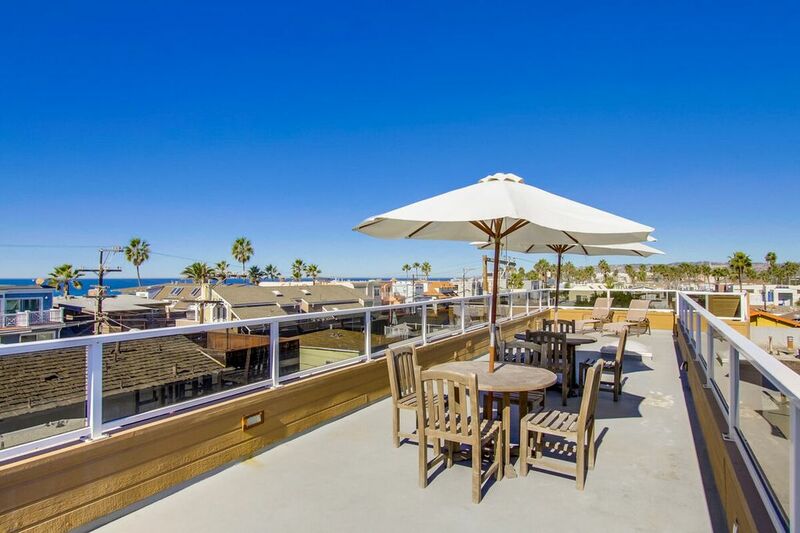 Take the spiral staircase up to this property's massive roof deck with 360-degree views of the beach, bay, and all of San Diego! Deck is complete with patio furniture and lounge chairs. On the ground floor you will find the 1-bedroom apartment complete with a kitchen, living room, full bathroom, direct access to the 1-car garage, and a bedroom featuring a Queen bed. Additional features of the home include central air conditioning, wireless Internet, two washer/dryers, and two garages. One 2 car garage with side by side spots and the other is a single car garage with direct entry to downstairs apartment *NOT SUITABLE FOR LARGE VEHICLES. * Should your vehicle not fit, there is free additional parking along Mission Blvd and a large overnight parking lot only a few blocks north. The property is located just a few yards from the famous San Diego boardwalk that runs along the Pacific Ocean. Step out on to the beach where you can surf, swim, boogie board, sun bathe or take romantic walks along the shore. You can also watch the surfers, visit quaint little eateries and coffee shops with internet access, dine at fine restaurants, stroll into funky little surf shops, and much more! Walk to nearby Belmont amusement park which touts a roller coaster and the Wave House were you can surf the man-made waves, enjoy the outdoor bar, open-air barbecue restaurant, fire pits and hammocks. This is close to several rental companies for bikes, boogie boards, parasailing, jet skiing and sport fishing. Or just sit back, relax and enjoy the magnificent sunsets! Just a few minutes to Sea World, The San Diego Zoo and Balboa Park. ATTENTION: This home is located in a very quiet, high-density neighborhood and is only suitable for quieter groups. There is a no tolerance policy for excessive noise, occupancy, parties, smoking, or pets. Failure to abide by these policies may lead to immediate eviction without refund. Please make sure you are comfortable with these policies before renting this home. Vacation worry free when staying with 710 Beach Rentals! Our homes are maintained to the highest standard and our attention to customer service is second to none. We are BBB accredited and rated Excellent by past guests on multiple platforms. With 125+ vacation homes in the coastal communities of San Diego, we are able to accommodate any request. 710BR is committed to providing a seamless rental experience when visiting America's Finest City! 600 Square foot roof deck with 360 views of all of San Diego from La Jolla to downtown to the beach and bay. It was a nice home really close to everything! The house was ideally located near the beach which provided may great family experiences. It was a pretty central location to many activities we engaged (Sea World, San Diego Zoo, Old Town, Airport, Belmont Park, groceries and eateries). 1. The house was well equipped with kitchen items, beach towels, beach toys, really everything we needed to have a grand time. The house accommodated our group and the rooms were fine. 2. We had a couple problems (explained below) but the property management resolved the issues very quickly. 2. We had a water heater pilot go out but the property management folks helped us find the tank and restart the pilot. 3. Getting cars into the parking garages was challenging - don't bring a large SUV - but after several rounds of practice we perfected the process. Overall we had a good fun experience and would recommend this location to anyone. Great Location, Clean House, Great Support. 710 beach rentals are a top-notch group and are great to work with. They help make our stay very comfortable and pleasant. The property was ideal for our stay and I will use them and this location again. The location was great! Property was clean and open floor plan was perfect for a large group. We would recommend it for sure. The interior space was perfect for our large group, but we wished there were screen doors in rooms with no windows so we could leave the door open for ventilation. We were also disappointed that the patio has no usable space because of the many planting beds. We had little children and elderly among our group who could not manage the spiral stairway going to the rooftop deck, so other than the small decks off the bedrooms, there was no outside space for them to enjoy. The others in our group did enjoy the rooftop deck. The kitchen was well stocked with cooking utensils, etc. and the apt was clean and well-maintained. It would be nice to have a few beach chairs available for renters who are flying in, as we did from Massachusetts. Overall, we had a great week and loved the spacious layout inside. My brother stayed in the 1 br apartment with his daughter and grand-daughter, and although it wasn't posted on the description we were told there was a pull-out couch in the living room. Upon arrival we discovered there was not so we borrowed a blow-up bed from a local relative until we had an empty bed upstairs. I would absolutely recommend this house to others. Location is great with easy access to the beach and bay, Belmont Park, restaurants, bike rental shops and stores. If we can't get back on beachfront as we have the last 12 years, we would rent here again. Mission Beach has countless options for fun and excitement! Bikes, Kayaks, and Paddle-boards (among other aquatic gear) can be rented all along the beach. Surf lessons are also popular, as are parasailing and jet skiing! Mission Beach is just a short drive to nearby attractions in Pacific Beach and La Jolla, and Sea World is just 5 minutes down the road! The Gaslamp District and other downtown sites are just 10 minutes away, and the world famous San Diego Zoo is just a 15 minute drive!